We offer a number of pain management procedures and options for our patients that best fit their condition. We will treat YOUR pain and help you begin the steps to a pain-free life. 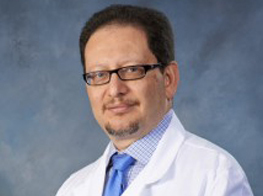 Dr. Badawy is expertly trained in the most advanced spectrum of minimally invasive treatment options for pain. We love to hear from our patients - read what they have to say! Dr Badawy has been implanting new technology to help his patients with chronic pain. He is achieving unprecedented pain relief and outcomes in general. It is so exciting to see his patients go from a10 to a 1 or 2 on the pain scale. They are reporting significant improvements in their overall life!! Thank you Dr Badawy!! No more cane for me!!! Forever grateful to you, Dr. Badawy. Your staff is great and the Hunters Creek facility is A+! Will recommend to all people with real pain. My hero! I have suffered with back pain for over 25 years and had to deal with doctors treating me like I was a drug addict. When I first saw Dr Badawy, I was very cautious...but I have now found a very compassionate and caring doctor! He explains all treatment to me and does not run out of the door after a 2-minute consultation. If you need pain management and like being treated like a human, I highly recommend him! I approve of Dr. Badawy! His staff is very courteous and his hands are magical! Dr Badawy answered all my questions and didn't seem rushed. He seemed to care about helping with my pain. I have only seen him one time but he seems like one of the good ones. A great doctor who cares about his patients. I had chronic headaches and been through many clinics, but Dr.Badawy was the only one who made the correct diagnosis and treated me right away! Truly a great doctor, his patients call him the pain magician. He is very knowledgeable and explains everything in details. I highly recommend him to anyone. The staff is very helpful and friendly. I spent close to 10 years going from doctor to doctor and wasn't happy until I went to Orlando Pain and Spine. Dr. Badway is the most amazing doctor - he treats you like an equal and is so caring. I have gotten numerous injections from him for my back pain and this man's hands are special gifts from God!